Now I know why people go to the sea when they feel suffocated. You can face your heart here. 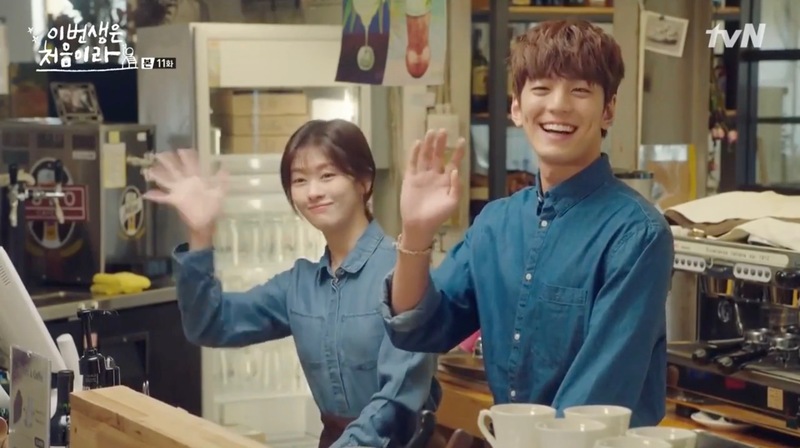 Because This Is My First Life/This Life Is Our First [이번 생은 처음이라] (tvN, 2017) is certainly one of my favorite dramas to date (and this out of 10 years watching, yes!). 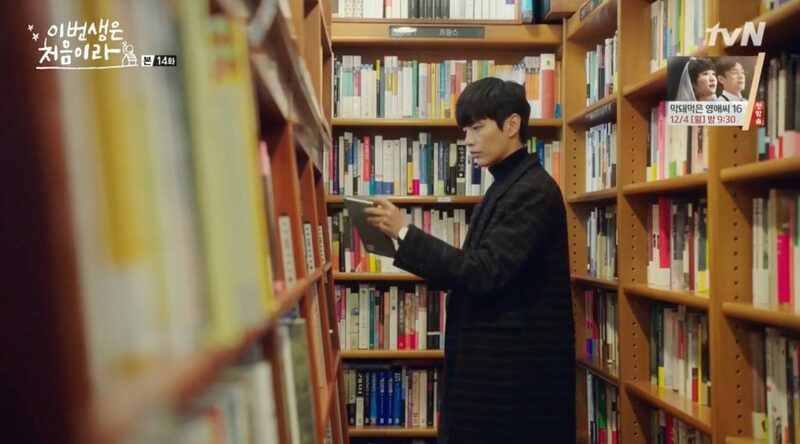 Apart from how the story is woven around books, I like how this drama is on the quieter side and allows for characters to develop, be reflexive and work on themselves. As in I Am Not A Robot, and even more so, this is mirrored by the select choices of filming locations. 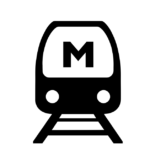 Here, we have no quick succession of places, no rapid switching from one location to the other. Most of the time, characters dwell in places and come back to places. There is some sort of location stability in this drama that I appreciate very much. A take-home message from BTIMFL for me is definitely: the lesser the locations, the better might be the drama. Instead of the usual listings, where you can see all filming locations on a map, I’ll be listing the sites in this entry, as usual, thematically. 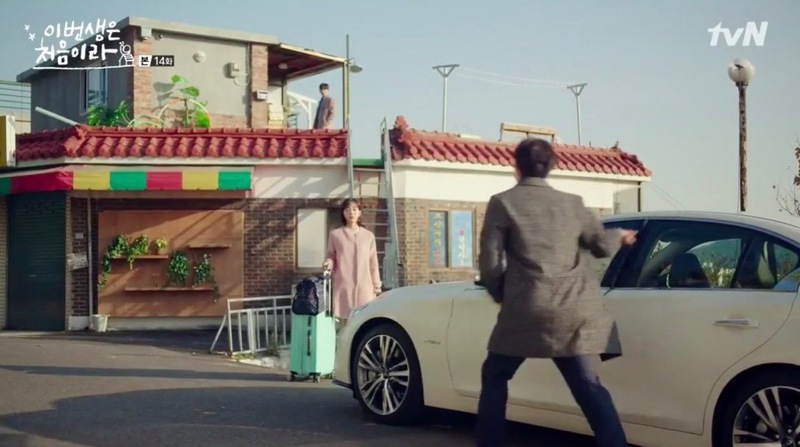 There are a few recurrent places here: the café that Yoon Ji-ho (Jung So-min) and Yeon Bok-nam (Kim Min-gue) work at, Ho-rang’s workplace or Ho-rang’s and Won-seok’s rooftop apartment. Yolo Café is in reality MU (The Lost Continent of MU) [무대륙]). The cafe, run by Bok-nam and his father, is where Ji-ho gets a part-time job in episode 6. Also, most of the principal characters of the show come through here for a visit at some point. Did you notice, like Amanda, how fitting the name ‘Yolo café’ is? 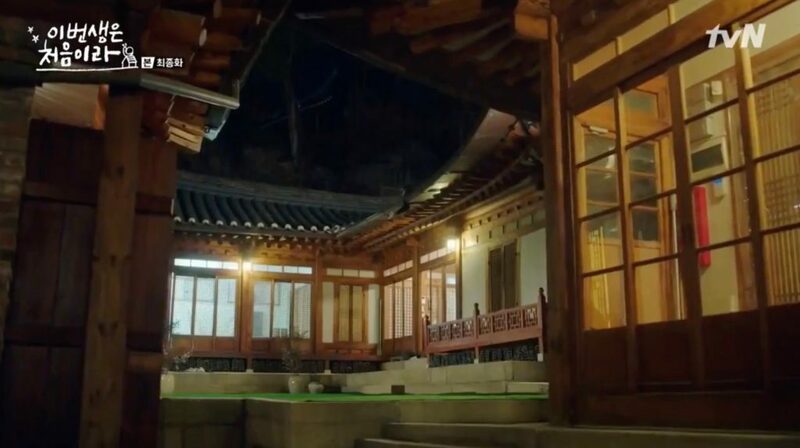 This Rooftop House, is the apartment where Yang Ho-Rang (Kim Ga-Eun) and Sim Won-Seok (Kim Min-Suk) started out living together and it later becomes the place in which Ji-ho and Nam Se-Hee (Lee Min-Ki) start anew. The restaurant that Ho-rang works at is located at Avenue France Pangyo [아브뉴프랑 판교]; also a quite frequented place in the drama. 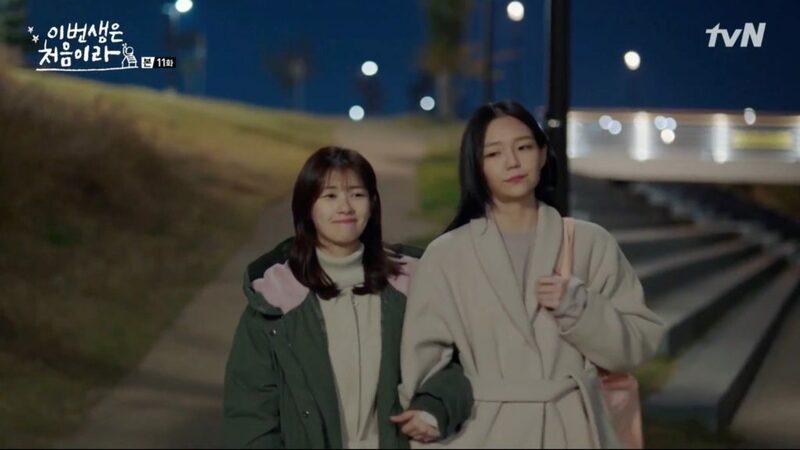 What I really appreciate in BTIMFL is that sisterhood is equally important to romance in this drama. From the outset, we get to know childhood friends Ji-ho — a Seoul National University (SNU) [서울대학교] alumni –, Ho-Rang and Soo-ji (E-som). The three of them are linked by deep ties albeit their different paths through life. We see girls as friends (!) that not only know each other very well. They are also a garant for each other to stay true to themselves. So, for instance, when Ho-rang all of a sudden starts to wear colorless clothes, this becomes a warning signal for her two friends. It is also very nice to see how much they trust each other — often more than their own family members. And as it should be for friendships to keep striving, the three of them regularly meet up; sometimes all together, sometimes only two of them. 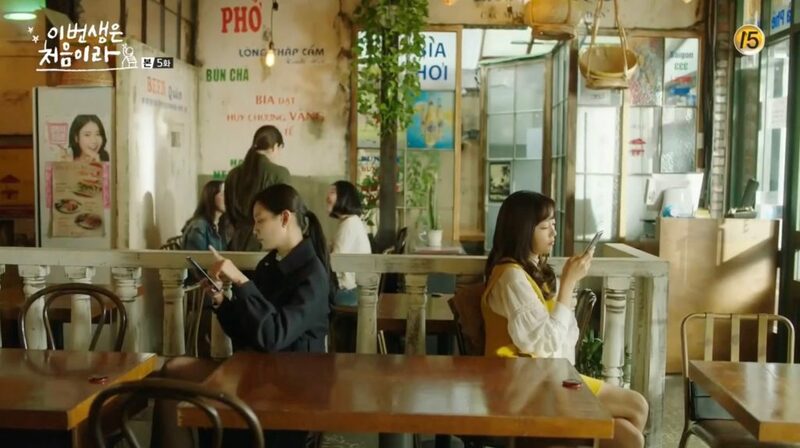 Another trait of this girlhood is that even if they have arguments, they are rapidly forgotten or talked out; like in episode 4/5 at Nha hang Nosang Viet Nam (Hongdae store) [베트남노상식당 홍대점] when Ji-ho tells her friends the news of her getting married to Se-hee (Kim Min-ki). 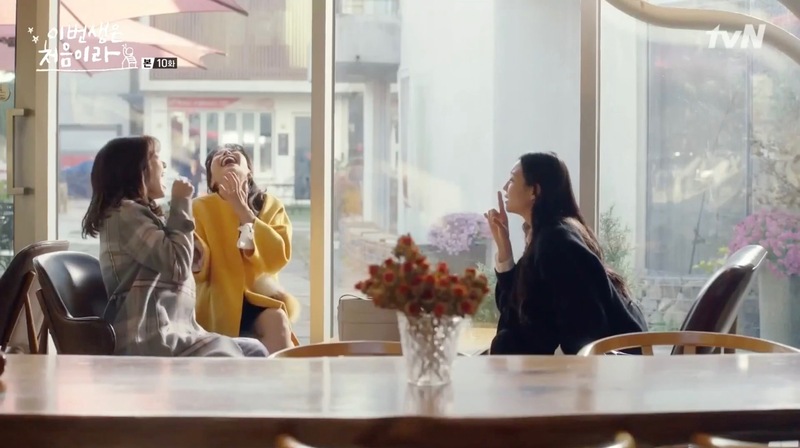 It is at The Jangmee [더 장미] in episode 10 that Ho-Rang happily announces to her two best friends that she was gifted a ring by Won-Seok. Also, Ji-Ho and Soo-Ji meet at Nanji Hangang Park [난지한강공원] in episode 11 after Soo-ji has found out about Ji-ho’s contract marriage. 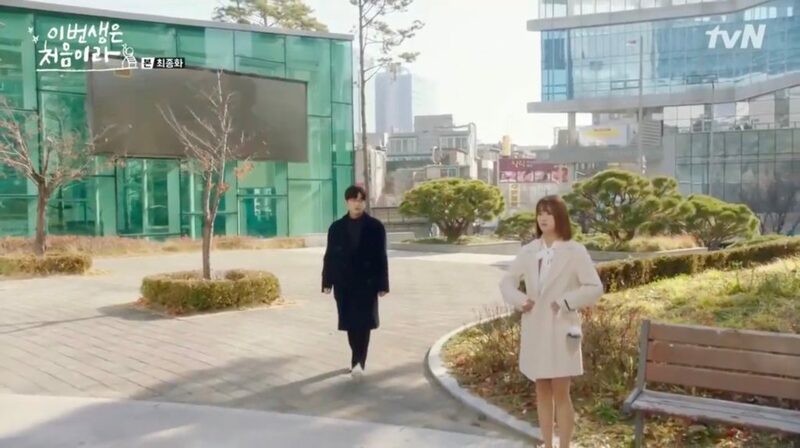 In episode 13, we see a flashback of these two friends at Seoul National University of Science and Technology [서울과학기술대학교 종합운동장] — talking about a book. As much as there is sisterhood going on in BTIMFL, the main male protagonists — Se-Hee, Ma Sang-goo (Park Byung-eun) and Won-Seok –, are also linked with similarly strong friendship bonds. Let alone the fact that they all work together at Sang-goo’s enterprise at the end. But as much as our three girls mostly meet at cafés and restaurants, these friends usually meet at restaurants or bars (and usually for having a drink). So sometimes we see them at work-related dinner outings as in episode 1 where they went to Wooh Ahh [우아 여의도점] — Yeouido Branch. 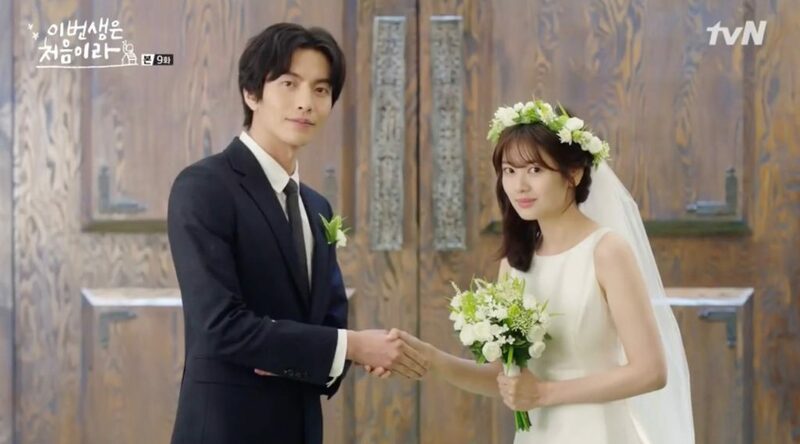 Ji-ho and Se-hee marry per contract (she needs a room, he needs a tenant) but they soon and slowly develop feelings for each other. The more the feelings grow, the more their similarities do also show. It was one of those love-stories that I could get behind because I saw the love and comfortableness grow in front of me (onscreen); from the first kiss, to the contract marriage to the first real kiss, to the real marriage. … and quite rapidly, the contract marriage at The Grace Kelly of Partyum House Gangnam [더그레이스켈리 강남] in episode 1/2. … and the first real kiss at Sinjeon-ri Breakwater. Coming back, the first real date at Gyeongui Line Forest Park [경의선숲길공원 / 경의선공원] in episode 12 where Se-hee gets a stuffed animal snail for Ji-ho. They continue their date at Hakrim Dabang [학림다방] where Se-hee gifts Ji-ho a pair of earrings. While trying out her earrings in the washroom, Ji-ho meets Go Jung-min (Lee Cheong-ah), who helps her with them. Little does Ji-ho know that Jung-min is Se-hee’s ex-fiancee, and that this was where they had broken up more than 10 years ago. 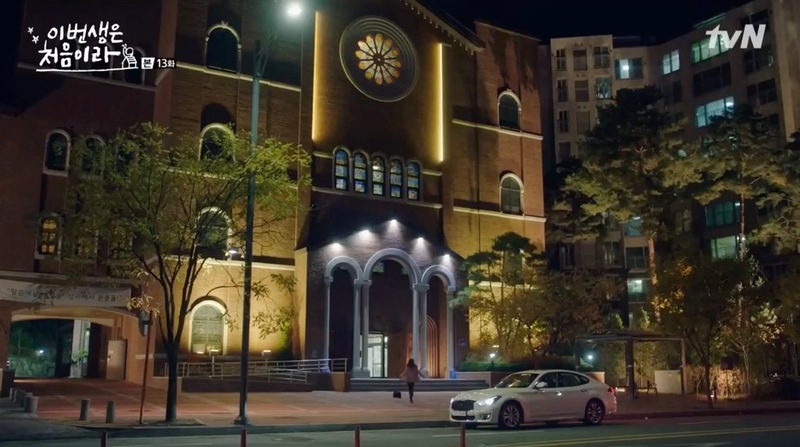 And then the somehow unexpected reunion of Se-hee and Jung-min (and soon to be Ji-ho’s boss) in front of St. Francisco Cathedral of Pangyo [판교 성프란치스코성당] in episode 14 for the first time after their breakup 12 years ago. Ji-Ho (Jung So-Min) — in good old K-Drama style — witnesses the whole situation. A little later (also in episode 14), Se-hee buys another present. This time the book There’s nothing wrong with changing things [‘운다고 달라지는 일은 아무것도 없겠지만’] by Park Joon [박준] at Mr. Vertigo Books [미스터버티고] — but he finally won’t be able to gift it this time. 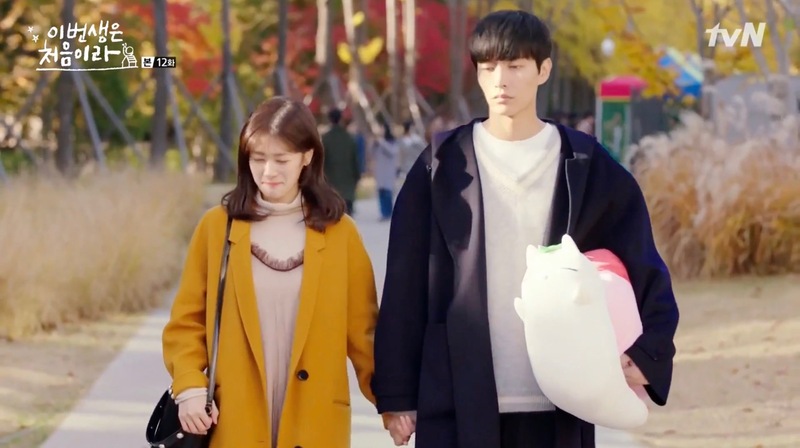 Parallel to the development of feelings, Se-hee and Ji-ho develop their own ideas (individually and together) of how they want to lead their relationship; ideas that are also clearly communicated to their parents and parents-in-law. In episode 14, for instance, at The Forest Garden [숲속정원], Ji-ho sets Se-hee’s father straight. She tells him that she neither wants to quit her job, nor become a housewife and mother nor a mediator between Se-hee and his family. Ji-ho’s ideas about how she wants to be in a relationship and with her partner also lead up to the decision to separate from Se-hee to be able to start anew as a couple and spouses. 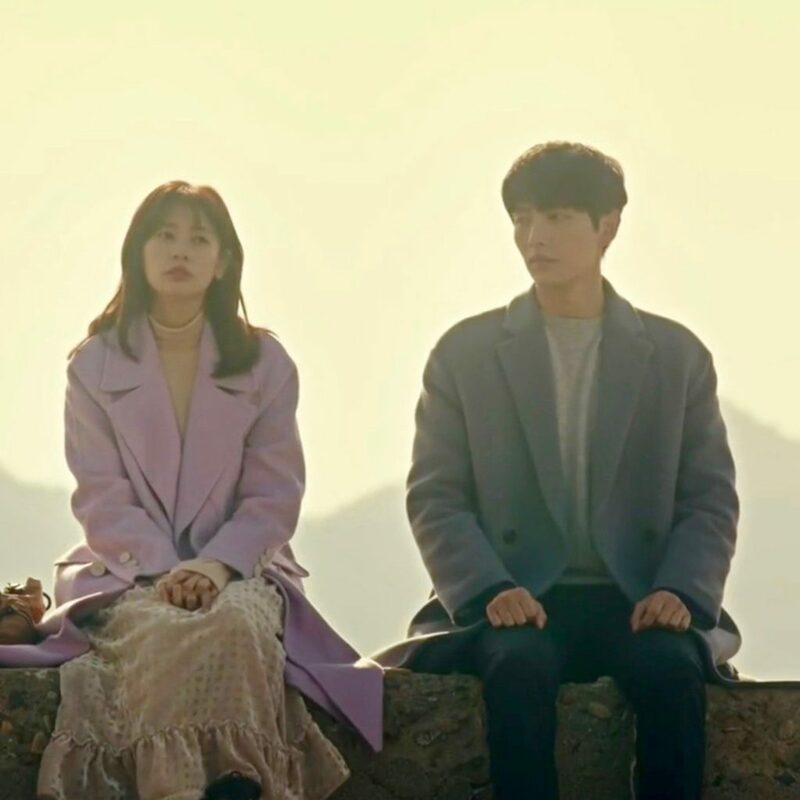 During the separation, in episode 16, she lives at Kim Hyeongtae’s House in Gahoe-dong [김형태가옥], while Se-hee sells his apartment and moves in the now empty rooftop apartment of Ho-rang and Won-seok. Finally, Ji-ho moves in with him, they marry again and start their new couple life here. “Against the stream” might be the best way to sum up Soo-ji and Ma Sang-goo. They are like the louder version of Se-hee and Ji-ho. But both couples are quite similar in the way how they listen to one other, communicate and resolve problems together and stand up for the other. The moment at Wonhyo Bridge [원효대교] in episode 13, when Su-ji and Sang-goo discuss their misunderstandings is a telling example for this. 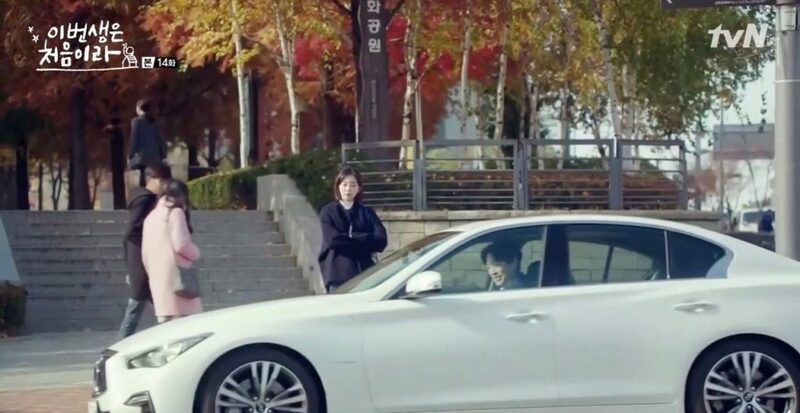 Another one is this situation at DDMC [동아디지털미디어센터] in episode 16 when Soo-ji rides up in a motorcycle to pick Sang-goo up at much to the surprise of her ex-manager Kim. 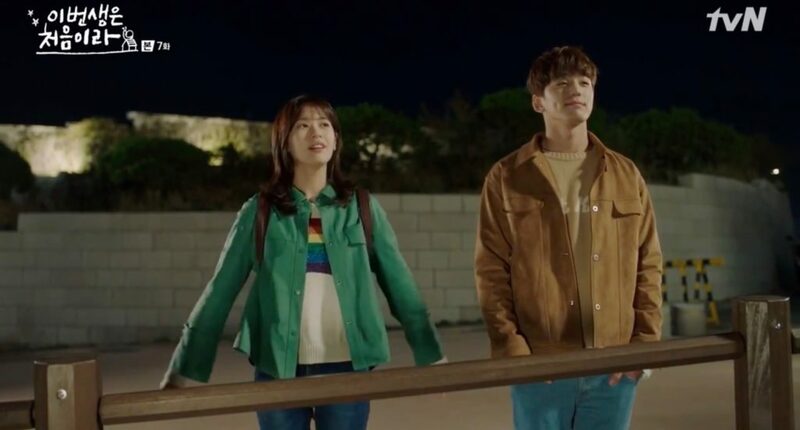 As much as Ji-ho & Se-hee and Soo-ji & Sang-goo’s relationships are based on honest communication and establishing a culture of communication in their couple, Ho-rang and Wo-seok’s relationship runs again and again into problems because a lack thereof. They are crystal clear about their intentions and feelings when talking to their friends, but they do not seem to be able to translate this to their couple. It’s therefore no wonder that this is also the only one of our three couples where both need to be constantly reassured of the other’s love. Also, it is the only couple where both get closer to somebody else after their breakup only to understand the lingering feelings for each other. Unfortunately the breakup didn’t make them progress; neither as persons nor as a couple. So what happens is that even in flashbacks — as at Yatap Station [야탑역] — we see them being upset about each other; all because they do not address things. But the best object that represents their miscommunication is Ho-Rang’s dream sofa sold at sysdesign — Pangyo Branch [시스디자인 판교점]. She comes here several times in episode 3 and 4 to test-sit it. 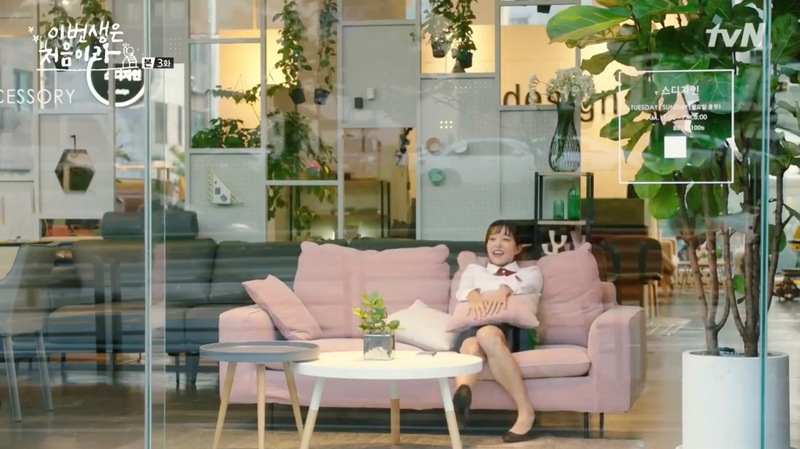 But in reality, it is not really the sofa that Ho-rang dreams about but marrying Won-Seok and living in an apartment large enough so that it can contain a sofa like this. The sofa only symbolizes her most profound dream (marriage & becoming a mother). But Won-seok gets it all wrong (again) and buys the sofa as a surprise and Ho-rang is frustrated because this was not the surprise that she has waited for. The sofa then ends on the terrace of their rooftop apartment because it doesn’t fit inside. After their break-up, Ho-rang gets closer to Shin Young-hyo (Kang Seong-wook) and they regularly go out. In episode 14, he picks her up at Water Light Culture Park [물빛문화공원] to go out for dinner. Over the episodes, Won-seok gets closer to his work collegue Yoon Bo-Mi. It is only in episode 16 that he tells her at the DMC Cultural Park [DMC문화공원] that he his still too attached to Ho-rang. 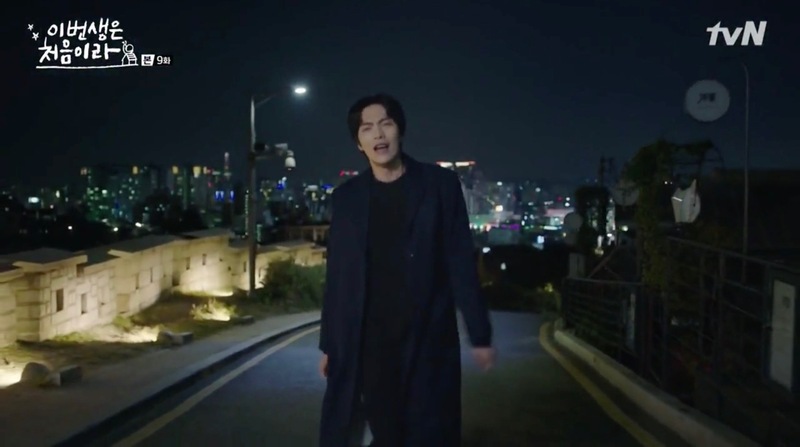 “A girl should not walk alone at night,” this is how we usually hear the hero accuse the heroine in K-Dramaland. Doing so, this K-Dramaland convention tells us that the streets are dangerous for women at night. It also tells us that if a woman should decide to venture out into public space at night, she should do so in company of a man. Because a man can protect her from danger. That danger is eventually, of course, other men. This means also, that women need a protector because they are thought to be physically inferior, i.e. that they cannot protect themselves. Another thing this line tells us is that all men are out there to do harm to women and that especially in public, at night. We can also deduct, that those men are strangers to the woman in question. More so, this trope tells women, that it is normal that they will be aggressed and that it is normal that men are aggressors and nothing can be done about it. I more than salute BTIMFL for the divers twists it gives to all of the underlying meanings of the You-Shall-Not-Walk-Home-Alone-At-Night accusation. First of all, we learn that it is not always strangers but persons very close to women — and statistically and in RL this definitely holds true — that will sexually harass women. And second we see that it must not happen in the streets, in public space. So we see a dejected Ji-ho walking through Jahamun Tunnel [자하문터널] in the middle of the night in episode 2 after escaping from her temporary lodging when her close colleague and love interest Director Gye (Kim Wook) drunkenly had tried to force himself on her. Before this, we see the toll this had on Ji-ho when she — still in shock — stops in her tracks and glances at her reflection in La Retro [라레트로]‘s shop window, as she tries to think of whom to call to talk about it. And Ji-ho speaks up! She doesn’t accept this as a fate defined by her gender. When taken to the restaurant Asosan [아소산 본점] by writer Hwang in episode 3 to meet her aggressor Yong-seok and Director Park, Ji-ho does not comply in downplaying the situation. Neither does she accept that it was her fault. She speaks up and leaves. Another situation, then, in episode 8-9 at Naksan Park [낙산공원] shows us that not all men are out there to aggress women at night in public spaces. Men can take no for an answer. And men can protect, yes, and this is what Se-hee does when he thinks that Bon-nam has bad intentions: he runs as fast as he can up these stairs at Ihwa Mural Village and passes by Café Gaeppul [개뿔] to Naksan Park. (I liked this part a bit less in the drama as it played hugely with the idea of all men=agressors). In again another situation, we also see that not all men take sexual harassment for a taken-for-granted fact. 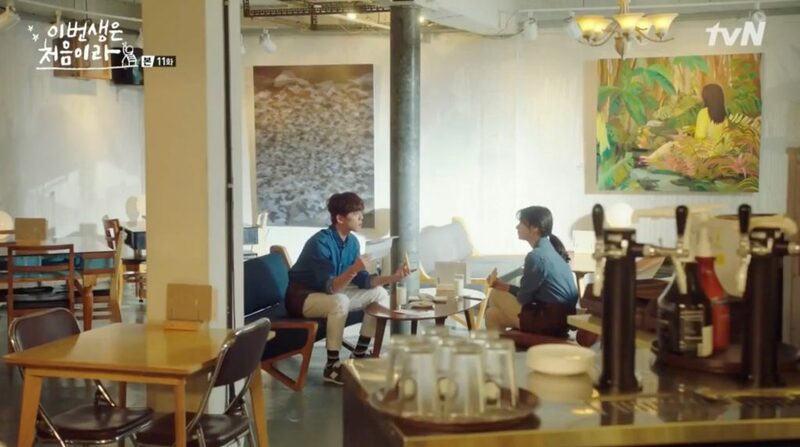 When meeting Yong-seok at café colline [콜린] in episode 14, Se-hee — instead of expressing solidarity with another man — punches him in the face. Hard. Thanks for journeying with us through this thematic recap. Thank you for this article. Appreciate it immensely!